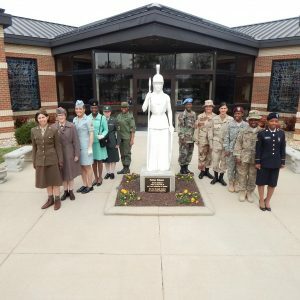 The Friends of the Army Women’s Museum Association (FAWMA) is a nonprofit, 501 (c)(3) educational and charitable, organization. 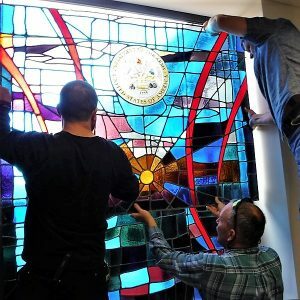 Our sole mission is to provide volunteer and financial support to the U.S. Army Women’s Museum at Fort Lee, Virginia. We are a “roll up your sleeves and work” group and look to bring new people into the association to help with museum activities, association support and various fundraising efforts. Our Board of Directors ensures that we are careful stewards of the monies we receive with the lion’s share of each dollar going to the museum. 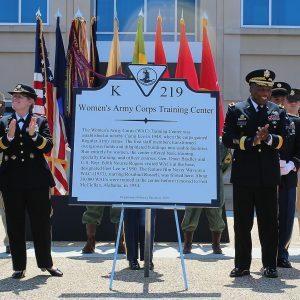 Our goals, defined by the Museum Director, are to ensure that the Museum’s exhibits, programs and collections are inclusive of all the time periods that Army women have served and accessible to the largest number of people possible. We are proud to say that FAWMA donations have been a huge support to the recent renovations to the museum. What we can do and how we can operate is defined by the IRS and Army Regulations. Restoration of the iconic statue, Pallas Athene, which has graced the Museum’s entry since its dedication in 2001. 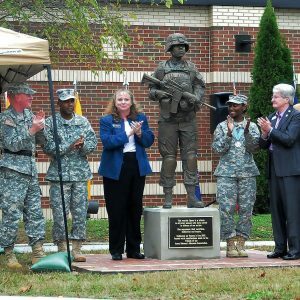 She stands majestically as the symbol of the women of the Women’s Army Corps. Placement of a Virginia Highway Historical Marker commemorating the WAC Training Center located at Camp/Fort Lee from 1948 to 1954.